French niche line Parfums de Nicolaï has renamed and reintroduced their Balle de Match fragrance as L'Eau de Sport. It joins the Eau Fraîche collection that already includes Eau d'Été, L'Eau Mixte, L'Eau Chic, Fig Tea and Eau sOleil. ...'Balle de match' is now called 'L'eau de Sport'. The talent however of 'Balle de match' is still indisputable: the fragrance is still a strong woody citrus composed of grapefruit, pepper and pink bays. Rediscover 'Balle de match' with its new name and wake up the champion inside you. 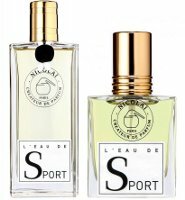 Parfums de Nicolaï L'Eau de Sport is available in 30 and 100 ml Eau de Toilette. They are doing sport scents now? Well, they already were — Balle de Match has been out for years. Didn’t know that, don’t follow the line too much. This line also includes L’Eau a la Folie, right? Or is that a different concentration than the others? Hey, good point — lo and behold, that one is now gone from the PdN website. WHAAAAT?!? It’s gorgeous and seemed quite popular with perfumistas, anyway. Thank heavens I bought the 100 ml. I’m not on the PdN website enough to know if they remove things when they’re just out of stock, as Hermes does. So no idea if it will be back or not. If not, you have my sympathies. I’m still sulking about the name change for Balle de Match. …but generally speaking nobody liked those either. ‘L’eau à la Folie’ has indeed been discontinued from our current collection. This is why you don’t see the fragrance online. However, the fragrance is still available in our Parisian and London shops and on special demand by calling us in Paris.